On July 7th, twelve police officers were shot in Dallas, Texas in an act of domestic terrorism. Five of them were killed. On July 8th, Pandora (a music streaming service) published this on their Facebook page…. 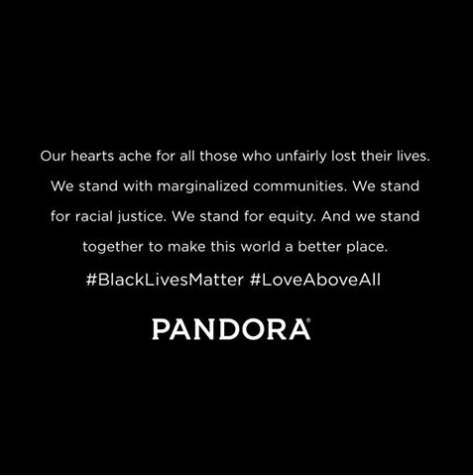 Pandora says that they stand for marginalized communities, racial justice, and equity….All obvious references to the Black Lives Matter movement. And Pandora says that their hearts ache for all those who unfairly lost their lives. Let that sink in. A day after five police officers were murdered on the streets of Dallas, Pandora’s heart wasn’t aching for those that lost their lives. Pandora’s heart was aching for those that UNFAIRLY lost their lives, and then Pandora went on to pander to the Black Lives Matter movement. I can’t help but see the obvious undertone. Five cops were murdered, but their death wasn’t UNFAIR. Those cops were part of the system of oppression, they probably had it coming. After all, somewhere, sometime, some cop probably unjustly shot some black man. So the deaths of those five cops wasn’t UNFAIR, it was just evening the score. The day after the murder of five police officers in an act of domestic terrorism Pandora chose to celebrate #blacklivesmatter. Not blue lives, not all lives, but the movement that has repeatedly thrown fuel on the fire that killed those five officers. So Pandora, you can celebrate the BLM movement. You can talk of equity and justice. I hope you do. Because that’s the same conversation the rest of American is beginning to have as well. But be careful what you wish for, because justice and equity don’t look anything like what you think they do.